Speaking to Bola Ray on Starr Chat, Hon. Dr. Dominic Ayine, one of the appointees of Former President John Dramani Mahamah to the office of Deputy Attorney General and Minister of Justice, declared his support for the yet-to-be-declared 2020 candidature of his former boss, John Dramani Mahamah. 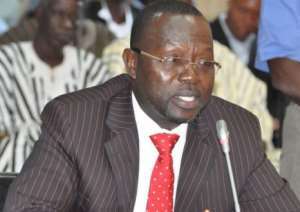 Justifying his choice, the Bolgatanga East MP said that even if H.E John Mahamah is eliminated from the flagbearership race, the NDC is still not likely to choose "another Northerner" to lead the party into the 2020 presidential elections. I respect Hon. Ayine's right of choice. It is his inalienable democratic and natural right as guaranteed by the 1992 constitution. But I respectfully disagree with the justification he ascribed to his choice. First and foremost, as a long standing law tutor, an attorney General and now Member of Parliament, Hon. Dominic Ayine should have known that, politically, Ghana is divided into ten (10) administrative regions. They include in no particular order; Greater Accra Region, Central Region, Volta Region, Ashanti Region, Western Region, Eastern Region, Brong Ahafo Region, Northern Region, Upper East Region and Upper West Region. Per our constitution, each of these regions has equal political rights. Political jurisdictions and administrations are not based on a north-south divide as Hon. Dominic Ayine seeks to project. H.E John Dramani Mahamah and the Second Deputy Speaker of Parliament, the Rt. Hon. Alban S. K. Bagbin are not from the same regions. Whereas former President Mahamah is from Bole in the Northern Region, Hon. Bagbin is from Sombo in the Upper West Region. They don not even speak the same languages. Whereas H.E John Mahama Speak Gonja, Hon. Bagbin speak Dagaare. I am not even sure they will understand each other if they decide to speak in their respective local dialects. And so, I was very surprised to hear the seasoned lawyer and lawmaker argue in the manner that he did. The Second reason why I disagree with the argument forwarded by the Bolgatanga East MP is that the NDC is one of a fair political party where one does not have to come from a certain region, tribe or even family before one can be considered to lead the party in the high office of President. The NDC has always placed merit over ethnicity and tribalism. And so, since 1992, the NDC has been picking candidates from Central Region either as running mates or flagbearers, based on merit. You can mention H.E Kow Nkesen Arkaah who was Vice President to President Jerry John Rawlings from 1993 to 1997, you can also mention Professor John Evans Atta Mills who was vice to President Jerry John Rawlings from 1997 to 2000. H. E. Prof Mills later became the NDC flagbearer in 2000, 2004 and 2008. But for his death, he was the NDC flagbearer for 2012 seeking re-election to complete his second term. Following the death of Prof. Mills, H.E Paa Kwesi Amissah Bekoe Arthur was also selected to replace H.E John Dramani Mahama who then assumed office as substantive President. Notwithstanding these facts, as we speak, there are two potential candidates from the Central Region who have already made it public their intentions to yet again lead the party into the 2020 election. They include Hon. Kweku Ricketts George Hagan, former Member of Parliament for Cape Cost South Constituency and Hon. Ekwow Spio-Garbra who served as minister of education under H.E Jerry John Rawlings and recently served as Trade and Industry Minister Under H.E John Dramani Mahama. There are even rumours that the Vice President, Kwesi Armisah Arthur and Hon. Hannah Tetteh are likely to also contest should John Dramani Mahamah say he will not contest even though they themselves have made any public declarations yet. Will the NDC disqualify them because they are all from a region where the NDC has been picking candidates, since 1992? The third reason why I do not agree with my senior comrade, Hon. Dr. Dominic Ayine, is that, in a nation like ours where we preach oneness to secure unity in diversity and a peaceful coexistence for national development, I least expected a Member of Parliament to endorse, support and seeks to promote tribalism and ethnocentrism in our body politic. It is very unfortunate and I think the member of Parliament should render an unqualified apology to the good people of Ghana. Tribal politics is, and will continue to be a threat to our development if arguments like the one forwarded by the Member of Parliament is given a listening ear. Stakeholders like our members of Parliament should take bold steps to eradicate tribalism and ethnocentrism from our body politics. Let us give absolute credence to merit. We have come to an important stage in the growth of our democracy where society heavily look up to stake holders like Hon. Dr. Ayine to help charter a better future devoid of tribalism. As a first year student in the Kwame Nkrumah University of Science and Technology, I was impressingly welcomed to the fascinating game of students politics with a lasting hope of positivism for the future of this country when students massively voted for a brilliant young man, Laar Philemon as President of the Students Representive Council. Before his election, Mr. Philemon Zaaninye Laar was the host of the widely listened "Community Watch" programme on Focus FM, a campus based radio station. This historic landmark victory broke the long held myths of history that suggested that it was practically impossible for students from some parts of this country to become SRC Presidents in KNUST no matter the leadership qualities they possessed. On the back of the well crafted "Strategic Renewal" campaign message and the "Ur Mind 4 Dey" chorus that came with it, standards were broken and new ones set as we celebrated the beginning of the new dawn that marked equal opportunity for all. I still enjoy the positivism of that joyful day in my heart. I am told that so far, no SRC President has beaten the sterling leadership records that Philemon Zaaninye Laar has set in KNUST-SRC. We have high hopes of Uniting this country into a nation beyond tribal and ethnic biases. The forth and final reason why I disagree with Hon. Dominic Ayine is that, in my opinion, Hon. Bagbin offers a more credible choice to the many aggrieved NDC members and floating voters who out of anger refused to go out and vote. I am talking about the close to 40% of registered voters who failed to turn up and vote in 2016. A good percentage of this number were potential votes for the NDC. Hon. Bagbin is unblemished with all the incumbency hazards and disadvantages that attacked and tainted the credibility of H.E John Dramani Mahamah. The NPP has a lot of heckle to do to the NDC should JM become our flagbearer than they have against Hon. Alban Bagbin. Considerably, Hon. Bagbin is well marketed and so he is not a total stranger in our political space. Let me conclude by saying that the eminent failure of the NPP government do not offer the NDC an automatic win in 2020. History is always there for us to learn from. President Kuffour's 2001 to 2004 government was too bad, if not worse than this current Nana Addo's government but Ghanaians still retained the NPP to continue in a second term, in 2004-2008. Perceived Violence Is What Is Making Islam Unattractive To The Youth! How Can Any Body Say That Dr. Nkrumah Was An Opportunist?